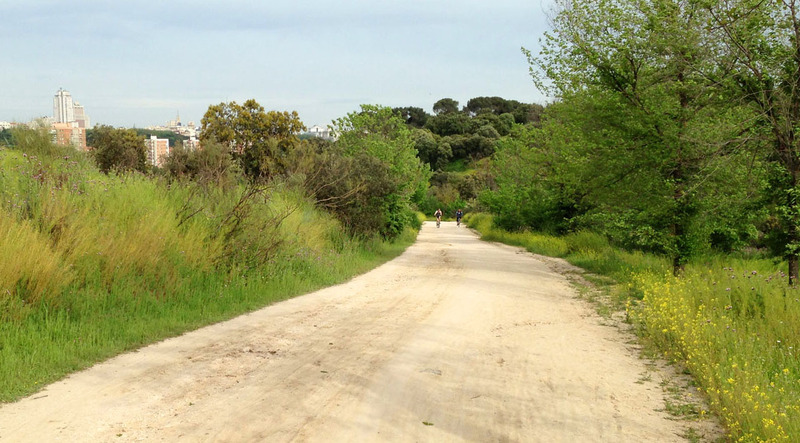 This is, in my opinion, Madrid's best running trail. 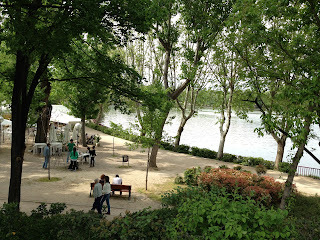 It circles through the Casa de Campo countryside just west of the Madrid old town. If you've ever stood near the royal palace up on the bluff and looked westwards across the rolling countryside, you've been viewing the Casa de Campo. I first discovered this area many years ago, and I was excited to try it again this week on a business trip back to Madrid. The Casa de Campo is an area of rolling hills covered by scrub oaks, Spanish pines and bushes, the site of an old royal hunting grounds. The name comes from the hunting lodge that once stood on the land. Since the 1930s, it has been a public park. There are lots of trails criss-crossing the landscape, but this route will take an easy-to-follow loop along the main trails. But once you've gotten to know it a bit, you might want to explore other trails weaving their way through this extended area. If you are staying anywhere in central Madrid, you can easily get to the start of this run, just west of the royal palace. Or, if you are staying further away (or you want to avoid running uphill to get back into town) you can take the Metro to the Lago station (Linea 10 towards Puerta del Sur). 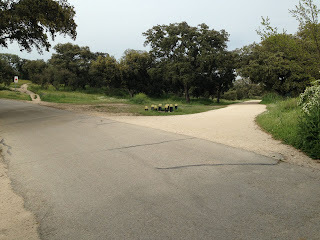 This will place you at the southwest corner of the Campo lake, right on the route. I put the official start of this route at the western end of Cuesta San Vicente, the busy street that heads westwards along the north side of the Sabatini Gardens and the Campo del Morro park, below the royal palace. 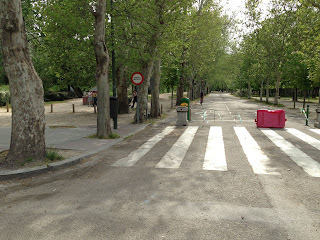 At the traffic circle, cross Paseo Virgen del Puerto and run diagonally to the left through the new park, heading westwards downhill to the river. 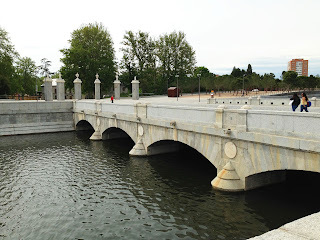 Cross the stone pedestrian bridge over the Manzanares River and head straight west along the paved, car-free Paseo Embarcadero. 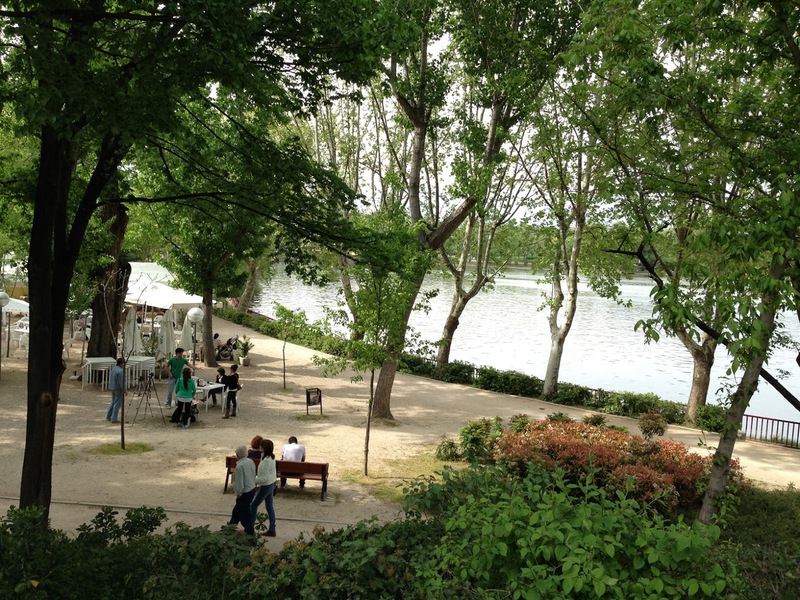 You will go uphill and then around the corner of the Lago, a small, nicely landscaped lake used by rowers, and lined by a promenade and parkland. You will pass several nicely done trail maps of the Campo at this end of the park. Later, though, you won't find any more, so best study them now! You'll notice a lot of mountain bikers, too. The sport has really taken off in Madrid in the last few years, and this is ideal country for it. You'll have to watch out for them speeding down the hills. 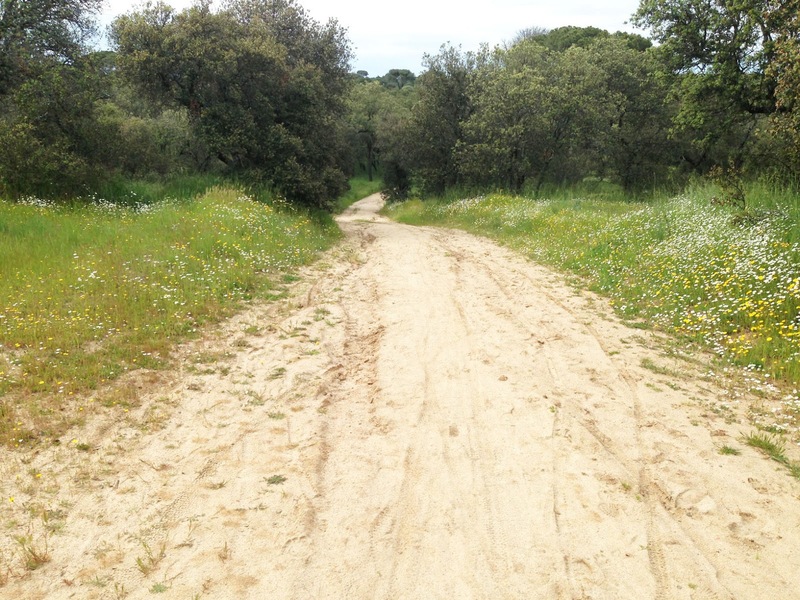 It's best to take the dirt paths parallel to the paved streets when you are heading up or down a big hill. Run past the south shore of the lake and the restaurants lining its western shore. To the left, you can see the Lago Metro station. We need to keep going straight ahead, westwards. You will see a paved road, the Ronda Lago, blocked to cars. Keep running westwards along the road, or take the dirt path parallel to the road on the right side. The road follows a stream on the left side. In less than a kilometer from the lake, you will cross an intersection and come to a spot where a parking area is visible along the left, for the amusement park behind it. Just keep running straight. In another half-kilometer, you'll come to a spot where the road splits. Follow the paved street to the right side. NOTE: in the middle, between the two paved streets, there's a wide dirt path that heads uphill. This is the new mountain-bike path, which is also a good run. It follows a ridge to the west end of Casa de Campo, and is used by a lot of runners and hikers as well as bikers. Follow the paved road as it turns to the right to head north, up a hill. Go straight up the hill, and then down again on the other side, watching for out-of-control bikers. You will be running along a fenced-in protected area on the right side. When you get to the bottom of the hill, turn to the right to run eastwards along this side of the protected area. You are now running on a wide dirt path, through rolling country. 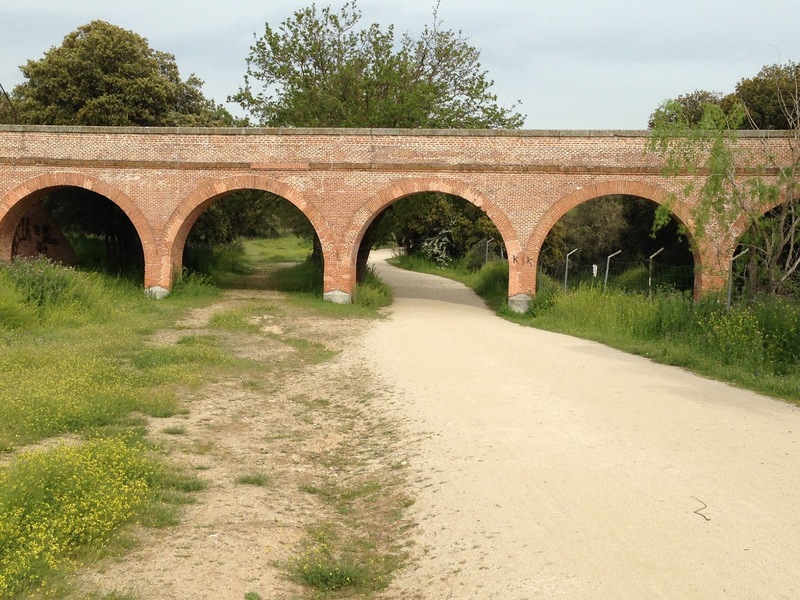 You'll go under an old brick aqueduct at one point. After a kilometer, you'll come to a gap in the fence, a place where a small trail turns right to go into the protected area. Ignore it and stay on the main trail. 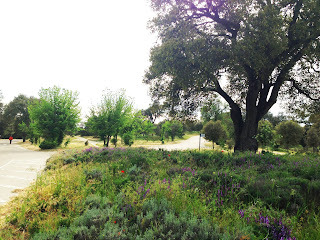 You'll see the Teleférico on the right side, a gondola ride from Parque del Oeste in Madrid, to the top of the hill past the protected area. Run downhill, towards the city-center buildings on the horizon. 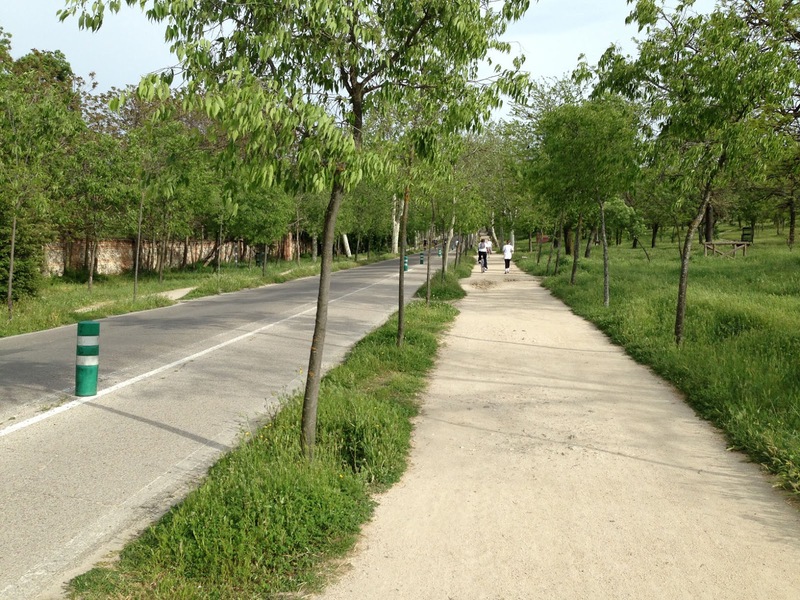 Keep going eastwards until you run into Madrid's main bike trail, where you turn right and head south. You'll hear the M-30 expressway just to the east. But, after passing a traffic island, the expressway noise disappears as it curves away and you run by a walled-in garden to the east. 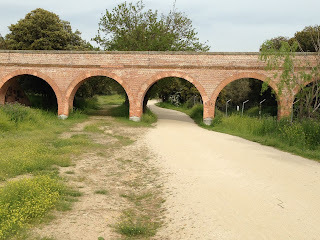 In less than a kilometer, you will hit the east end of the Lago, where you continue eastwards until you get back to Paseo Embarcadero again (at another old aqueduct). Here, turn left and run the 800 meters back to the start again (or turn right to run the half-kilometer to Lago station.